Earlier today at MWC 2015, Samsung announced the Galaxy S6 and Galaxy S6 edge, but the company isn't ready to start selling the handsets yet. 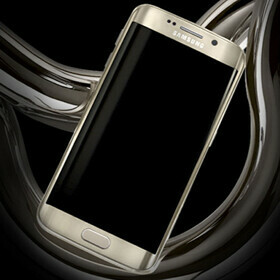 Both new flagship smartphones will be released around the world beginning April 10. According to Sam Mobile, Samsung officials confirmed the prices of the two handsets for Europe. Reportedly, the cheapest Galaxy S6 (32 GB version) will cost €699. The 64 GB model should be sold for €799, while the 128 GB variant will be priced at €899. Unsurprisingly, the Galaxy S6 edge will be more expensive: €849 (32 GB), €949 (64 GB), and €1,049 (128 GB). We should expect prices to be similar in the US, thus starting at $699 for the Galaxy S6 32 GB, and going up to $1,049 for the Galaxy S6 edge 128 GB. Naturally, these are prices for the unlocked Galaxy S6 and S6 edge. US carriers will most probably offer the two handsets starting at $199 on contract (though we assume that the S6 edge will actually be available starting at $299). Of course, given the build quality (metal + Gorilla Glass 4) and the high-end features that the S6 and S6 edge are offering, we were expecting them to be expensive. Though maybe not that expensive. What do you think, are the prices listed above too high, or just right? So that ridiculous pricing model won't be restricted to Apple. I meant paying 100€ more for a step up in memory which costs the manufacturers very little. Indeed. Don't come defend Samsung. Samsung isn't your fathers company. It's ridiculous to price it so much higher with every upgrade. They even had an article about it where they bashed Apple for it. Samsung deserves the same treatment. Prices of Samsungs devices will drop quickly, iPhones are expensive all the time. And their value is up all the time, you don't lose much when reselling, you loose s**tloads when reselling any android phone. At the end an iphone is a better investment. Since you are talking about pricing. unless you are the second hand buyer. Mint, hardly used Note 4 goes for 475- 550€ over here. I for one welcome any price drops. agree, like Note 4, their current price in my country dropped about 150 USD from their first-announced price. and don't even bother to talk about their re-sell value. Did you read the title? It says MIGHT!! I am ready to get one. It appears cheap to me. I read that HTC M9 will cost €750. It's about the price of the memory increase, not the starting price of the handset. Given that the specs are the latest in technology and far better than iPhone, the €899 ($1072 in our country) can be somehow justified for the 128gb model. But since I'm not an early adopter, I'd like to see user reviews on April and May before deciding to buy this to see if the new touchwiz can optimize battery life and will not hog the internal storage too much just like what HTC One M9 did which is 21 out of 32gb ouch! No, they aren't. $650-$850 for the iPhone 6, and $750-$950 for the iPhone 6 Plus. The S6 and S6 Edge are nice, but as it has been proven time and again, Apple owns the premium segment. I think this will hurt Samsung more than it will help. By the way, the Edge would be the one I would choose, but I'm not sure I want to pay $100 more for just better looks than the normal S6. It's all good. We've all done it. And samsung price drops quickly in a few months. Just be careful not to buy a clone model. In a couple of months the prices will be more accessible for both versions. I though S6 Edge will be up to $100/€100 more expensive than the regular S6 but €150/$150 is a little bit steep. If 128GB model will be really that expensive, then f**k this and I'm going for Xperia Z4 basic model(probably 32GB) with microSD card. Sony, here's your chance! until sony sells its business and the chances of getting support for updates will be non existant. That is bonkers expensive €1050 is $1200. That's just crazy, and it just goes to show why they got rid of the SD card slot. €1050 is the price with EU taxes. Price in the US should be about $1050 (usually it's 1:1). Still quite a lot. But as Apple shows, base version is most popular and base S6 has 32GB, while base iPhone just 16GB. I just thought that Edge will be $50-$100 extra, $150 is a little bit too much. I am okay with paying $600, for a phone, as I am paying now. But $1000, don't you think that is a bit much, considering its competitors are around $600. I will still buy the s6. then i will sell my iphone 6 and i will only spend 500 even if i didnt. i would still buy it.